Flu season is upon us – and we are working on percents! What better time to estimate how many germs we have on our hands and investigate how long it really takes to get rid of them? The CDC (Center for Disease Control and Prevention) defines proper hygiene as vigorous hand rubbing with soap for 20 seconds. Most of my students were familiar with the 20 second rule, but not convinced of it’s effectiveness. So, we decided to collect the data and find out for ourselves! I gave them each a squirt of glowing germ simulating lotion which they rubbed onto their hands. We went into the bathroom, turned out the lights, and I shined the black light onto each students hands. This was FUN! They were quite disgusted with the amount of “germs” on their hands. They were even more surprised to see so many “germs” on their faces, which they had obviously been touching way too much in the five short minutes since they had applied the lotion. It was easy to estimate at this point that the germ count on their hands was at 100%. Let the hand washing begin! The students washed their hands with soap for 5 seconds and then rinsed. I turned the lights off again and we inspected them again with the black light. They were shocked (and disgusted) to see that their hands were still VERY dirty! Each student then estimated the percent of germs still on their hands. Our goal was to analyze germ data at 5 second intervals for up to 20 seconds. So we washed, analyzed, estimated, recorded and repeated three more times. It took a solid 20 seconds to eliminate the majority of the “germs” from the students hands. The most difficult places to clean were the fingernails and the creases in the palms. The most often missed spot was right around the wrist. Most of the girls were able to get the estimated percentage of germs down to about 2% while the boys seemed to get stuck at about 10%. The boys found this quite amusing. 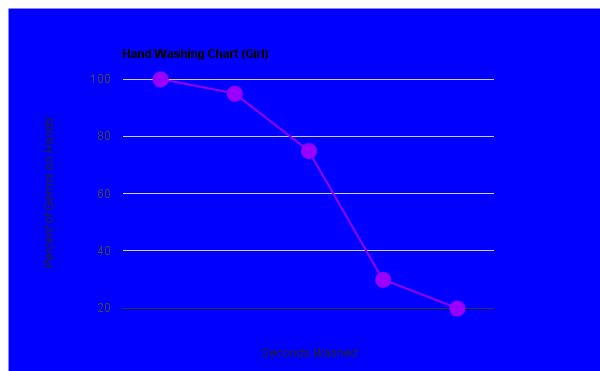 After we finally got back to the classroom we loaded all our data into Google Docs and created line graphs. We then uploaded them to the Handwashing page on our class Wiki. After we graphed our data in Google Docs we discussed our findings. The kids were surprised that it took so long to wash all of the germs off of their hands even though most of them had either heard about the 20 second rule or knew of a “hand washing” song. We then picked one of the songs, “Twinkle, Twinkle, Little Star” and sang it as a class while I timed us. We all enjoyed singing and it took us 23 seconds to sing the song. This was an extremely engaging and interesting activity! It did take an entire class period as we only had four sinks and one black light. But it really brought some fun to a cold winter’s day math lesson. Next year I would like make this like a “Myth Busters” activity. I have since heard Myth Busters did a hand washing episode but could not find it. I would also like the students to do more data analysis and possibly even some comparative analysis. 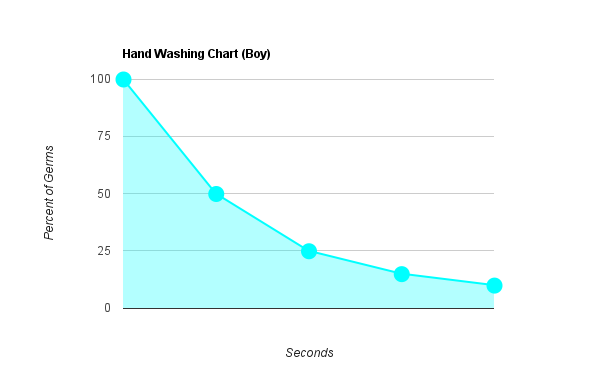 For this, I am thinking of percent of change between the boys and girls or for each hand washing interval. This entry was posted in Integrating Technology, Percents, Pre-Algebra by I Speak Math. Bookmark the permalink.